Our colorful new store front includes creative security screens designed and partially donated by Tom Roesch of Iron Fortress Security. Fall and Winter Hours -Tuesday through Friday, 12:00 noon to 7:00 p.m.; Saturday, 12:00 noon to 4:00 p.m. Closed Sunday and Monday. Season Opening Rides: Slow Roll Kick Off, Thursday, April 25, 7:00 p.m.
​Avenue for Everyone, Saturday, May 4, 9:00 a.m.
You can now make donations to Bikes for All People on-line through The Columbus Foundation's Giving Store. Just click the "Donate Now" button below! From bike repairs to routine maintenance, we work within your budget to help you get the most mileage out of your bike. Whether you bike for transportation, recreation, or you race every weekend, our expert team members will advise you on the best course of action based on your unique situation. Our inventory varies, but we always carry a range of quality items, from entry to pro-level options. 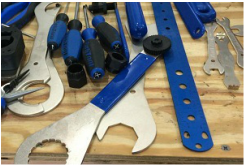 We also offer professional consultation and can custom order parts and accessories for you. 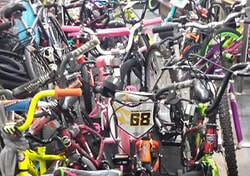 We have a selection of new and used bikes available for sale in our shop. We also accept used bicycles in good condition that we refurbish and then sell at affordable prices to individuals on the South Side of Columbus, who rely on bikes for transportation to and from work, or to children developing a love for biking. Revenue generated by Bikes for All People supports its mission of providing reliable, affordable access to cycling services and activities for everyone in the community. We build communities through people’s common interest in cycling. 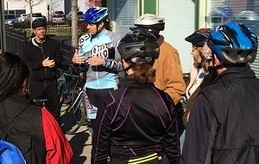 We frequently organize weekend group rides to bring people together in a healthy, environmentally friendly way to explore Columbus and its surrounding neighborhoods. These weekly rides draw individuals of all levels of experience. We typically meet at the Bikes for All People store Thursday evenings at 7:00 pm. Rides vary in distance and difficulty level, so be sure to view our calendar for more information.